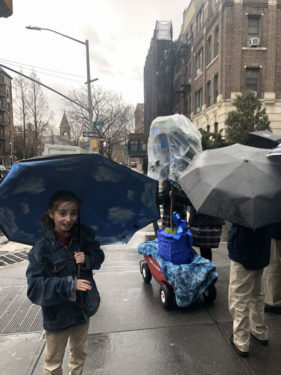 Organizer Sandra Rossier, who has three children at the Eighth Avenue school and one at the neighboring high school, came up with the idea following the October massacre at the Tree of Life Congregation in October that killed 11 congregants and wounded seven others. 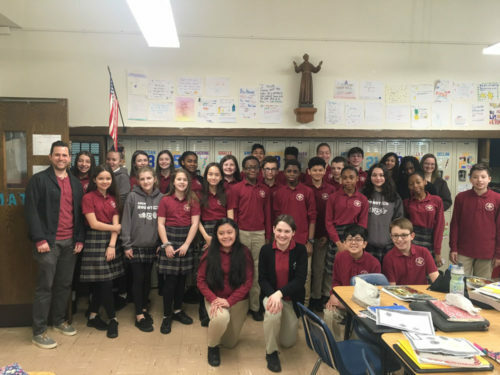 So Rossier purchased an orange tree from a local nursery – and decided to get her 13-year-old son Julian’s seventh grade class involved. 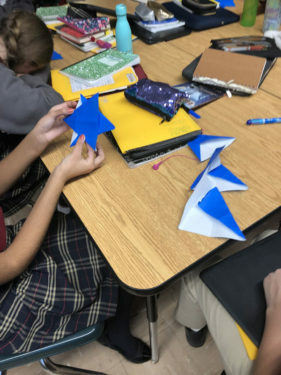 She, together with art teacher Avalyn Mathis, helped the middle schoolers to craft 11 origami doves to place on the tree – one for each life lost in the deadly attack. The decorated tree was a gift for the Congregation Beth Elohim synagogue on Garfield Place. 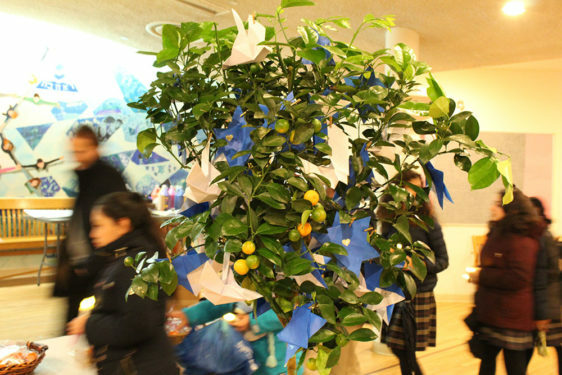 On March 21 – the second day of the Jewish holiday of Purim – the seventh graders, joined by Rossier, her husband Nicholas, 8-year-old daughter Natalia, Mathis and religion teacher Andrew Austin, lugged the decorated tree in a bright red wagon about six blocks over to the synagogue. Two students, Isabella Merchan and Clara Cronin, 12, volunteered to pull the wagon. That experience was particularly faith-deepening for Merchan. And for Cronin, just being present at the synagogue gave her a sense of gratitude. 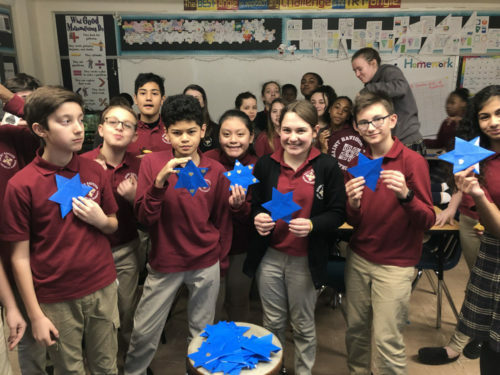 For their classmate Noa Yaron, also 12 – who is Jewish – the day of service was a meeting of her two worlds. That welcoming spirit was evident as soon as the group walked into the synagogue. They were led into a room where bags of sweet snacks – one for each student – were laid out on a table. Then, both Rossier and Cantor Joshua Breitzer of the synagogue spoke during a heartfelt ceremony. Breitzer said he reacted with “surprise and amazing gratitude” when he learned of the tree donation. 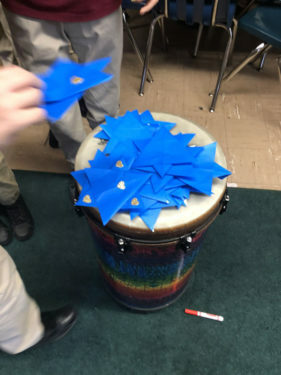 “It was such a wonderful expression of love and kindness and community,” he shared. 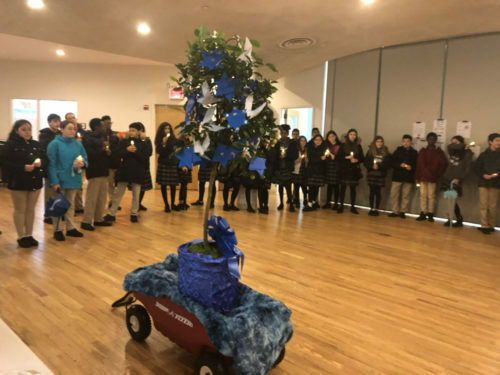 For now, the tree is being kept indoors – but it will be moved to a courtyard garden under the care of the students at the synagogue’s “Yachad” afterschool programming. 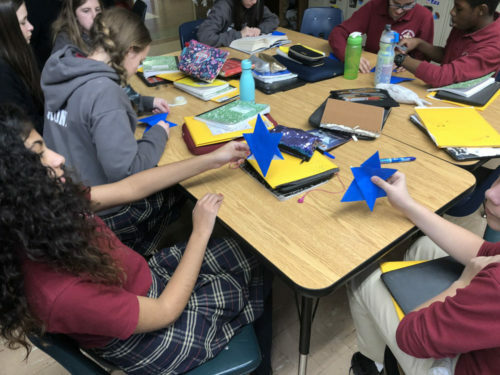 Rossier, who also has a 5-year-old son, Luca, at the school and 14-year-old daughter, Eliana, at St. Saviour High School – said she hopes to organize several more interfaith outreach efforts through a project she’s calling the Little Red Wagon Initiative. we do such acts of love and friendship that transcend our narrow borders. In fact, God may have been smiling. Thank you for this lovely act!